Among the causes of sigmoid sinus thrombosis (SST) which is a rare entity, we can see thrombophilia, head injuries, neoplasia, use of injectable drugs and, mainly, infectious diseases. , When the etiology is infectious, it is called sigmoid sinus septic thrombosis (SSST), and the most frequent causes are middle ear chronic or acute diseases. Concomitant complications are common among patients with lateral sinus thrombophlebitis; these are mostly intracranial abscess and meningitis. In the present report, a case of cerebellar abscess and SSST, secondary to chronic otitis media (COM) is described. Very few cases of these complications occurring concomitantly have been reported. The presented case should warn physicians not to think that this disease belongs to the past and that modern antibiotics have solved this problem and protect patients against life threatening complications. The patient was a 25-year-old male with the complaints of headache, pain, and discharge and hearing loss in his right ear. His pain was spreading along his neck just on the sternocleidomastoid muscle. He had these complaints for a long time but they became more pronounced in last two weeks and he began to have fever. The patient had gone to hospital before our clinic and a temporal bone computerized tomography (CT) had been performed and the patient was consulted to our clinic. In CT scan it was stated that the mastoid air cells and tympanic cavity were filled with a mass of soft tissue. The auditory ossicular chain was also destructed [Figure 1]. We detected purulent secretion in right external ear canal and perforation on the ear drum in our otoscopic examination and a hearing loss about 70 dB in air and 37 dB in bone conduction by audiometric examination. His fever was about 38.0-39.0°C that peaks two times per day. The patient hospitalized for operation and a new temporal CT was taken. In CT scan the right sigmoid sinus was reported as hypo dens suggestive of sigmoid sinus thrombosis. He was conscious, oriented and had no cerebellar signs. Ampicillin and ceftriaxone treatment was given to the patient and he was taken to the operation. Right side radical mastoidectomy operation was performed. In postoperative third day the patient began to complain about headache and he had fever again about 38-39°C. Blood samples were taken for culture and no microorganisms were detected. His WBC count was 11.93 × 10΃/μl. The patient suddenly began to lose his balance while walking and had difficulty in talking. Immediately a brain CT was taken and a hyperdens lesion was reported in right cerebellar zone with a 2.5 cm diameter and magnetic resonance imaging (MRI) was suggested. 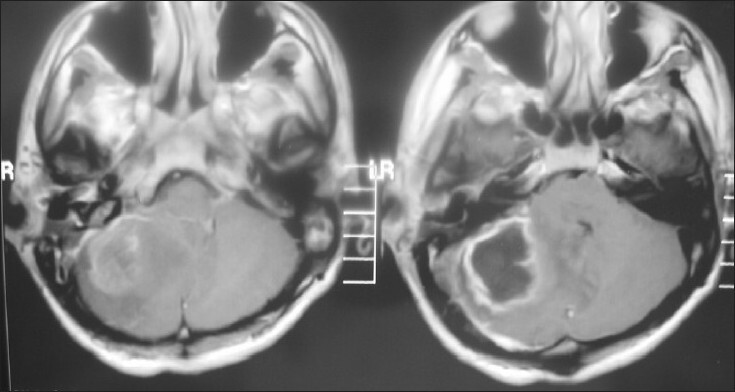 MRI revealed that there was a cerebellar abscess in right side with the dimensions of 32 × 32 × 20 mm [Figure 2]. The patient consulted to neurosurgery department and they took the patient to their clinic and operated him for the cerebellar abscess. After 6 weeks antibiotherapy the patient discharged from the hospital as cured. Ηilcan et al,  had a study to evaluate the incidence of complications of chronic otitis media in 324 patients. They reported 34 complications, with 9 intracranial and 25 extracranial. Among 9 patients with intracranial complications; they reported 3 meningitis (33%), 3 lateral sinus thrombosis (33%), 2 cranial abscess (22.2%), 2 cerebritis (22.2%), and 1 multiple complication (11.1%). Pνno et al,  presented 6 clinical cases that cases corresponding to admitted patients with intracranial abscesses (four in brain and two in cerebellum) due to chronic otogenic pathology. Penido et al,  had a retrospective study in their clinic among the patients with SST that are followed in a 10-year period. The mean age of patients was 26 and they detected SST more common in men. Most of patients had a SST mainly in left side and only one patient had his right side affected. In our patient mentioned in this study we detected a right sided SST. The patient presented the clinical symptoms mainly related to other complications, especially those with meningitis and cerebral abscess. They did not identify specific symptoms or any that would specifically suggest a SST diagnosis. In another study of Penido et al,  they reported 8 patients with SST in a 14 year period and did not report any case presenting specific symptoms of SST. However, in our case, symptoms of COM and SST were more obvious unlike the cases reported in other studies. Symptoms of cerebellar abscess began to be observed in postoperative period despite appropriate medical and surgical treatment of both COM and SST. This situation resulted in a delay in suspicion and diagnosis of a second concomitant complication like cerebellar abscess. We report this case to illustrate that severe complications of COM still occur in the world, to stress the importance of clinical suspicion in the post-antibiotic era. As in our case, the SST diagnoses have been carried out in patients with COM always associated with other complications, especially mastoiditis, cerebellar, and intracranial abscess. As seen in the literature review, most of the patients having SST and cerebellar abscess together have showed the symptoms of cerebellar abscess more prominently than the symptoms of SST. However, the symptoms of SST were more prominent than cerebellar abscess in our case unlike many others in the literature. That is why we had difficulty in diagnosis of cerebellar abscess in our case. The other reason was that the cerebellar abscess is uncommon due to advanced treatment methods and our patient was taking intravenous antibiotic treatment. Therefore, we suggest the otolaryngologists to keep the possible complications in mind while treating the patients with COM. We want to emphasize the necessity of cooperation of otolaryngologists with other specialists such as neurologists and radiologists during their diagnosis. 1. Deriæ D, Arsoviæ N, Dordeviæ V. Pathogenesis and methods of treatment of otogenic brain abscess. Med Pregl 1998;51:51-5. 2. Holzmann D, Huisman TA, Linder TE. Lateral dural sinus thrombosis in childhood. Laryngoscope 1999;109: 645-51. 3. Lin D, Reek JB, Murr AH. Internal jugular vein thrombosis and deep neck infection from intravenous drug use: Management strategy. Laryngoscope 2004;4:56-60. 4. Acuin J, Smith A, Mackinzie I. Interventions for chronic suppurative otitis media. Cochrane Database Syst Rev 2000;(2):CD000473. 5. Pearson CR, Riden DK, Garth RJ, Thomas MR. Two cases of lateral sinus thrombosis presenting with extracranial head and neck abscesses. J Laryngol Otol 1994;108:779-82. 6. Samuel J, Fernandes CM. Lateral sinus thrombosis. J Laryngol Otol 1987;101:1227-9. 7. Lundman H. Complications of suppurative otitis media. In: Kerr AG, editor. Scott-Browns' Otolaryngology. Vol. 3, Chapt 12. Oxford, UK: Butterworth-Heinmann; 1997. p. 1-29. 8. Çilcan MA, ªanlı A, Ünver ª. Complication of chronic otitis media. Journal of Kartal Training and Research Hospital 2000;11:907-9. 9. de Oliveira Penido N, Testa JR, Inoue DP, Cruz OL. 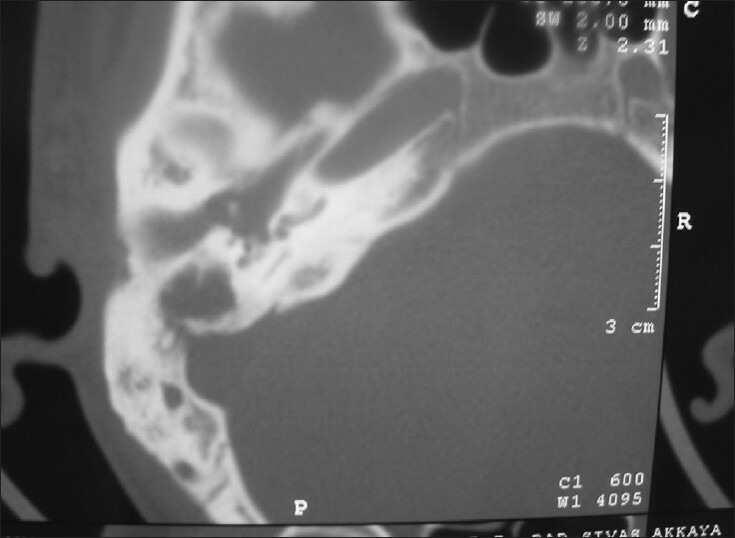 Presentation, treatment, and clinical course of otogenic lateral sinus thrombosis. Acta Otolaryngol 2009;129:729-34. 10. Píno Rivero V, Keituqwa Yáñez T, Marcos García M, Trinidad Ruiz G, Pardo Romero G, González Palomino A, et al. Otogenic intracranial abscesses. Description of 6 cases. An Otorrinolaringol Ibero Am 2004;31:23-31. 11. Penido Nde O, Toledo RN, Silveira PA, Munhoz MS, Testa JR, Cruz OL. Sigmoid sinus thrombosis associated to chronic otitis media. Braz J Otorhinolaryngol 2007;73:165-70.